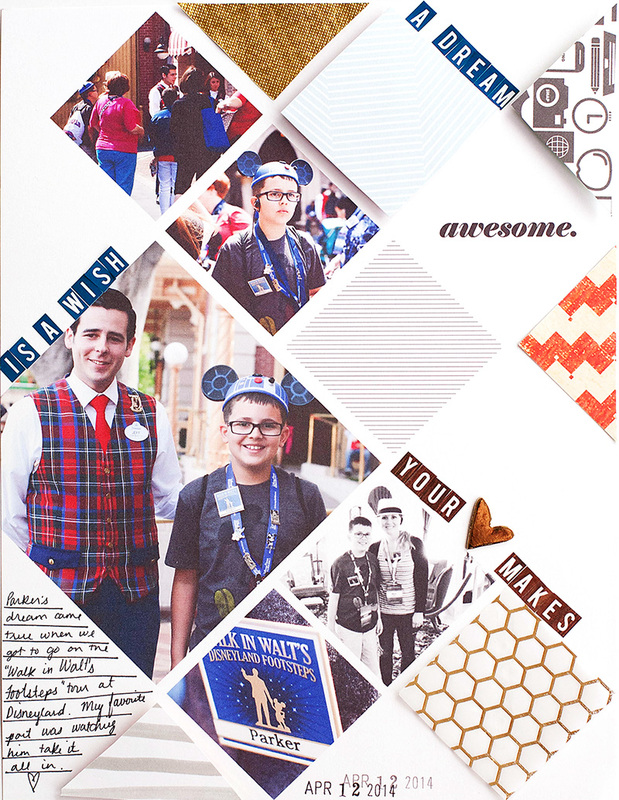 I LOVE using digital templates like this to easily create graphic inspired layouts. I made this one for the FREE Digital Basics class at Studio Calico – you can learn the basics of digital scrapbooking and see how we incorporate it into our layouts and Project Life spreads! Photos from the tour we got to take while at Disneyland this last trip. Of course I came looking right away because I spied some mouse ears in the photos, but I didn’t realize there was a FREE class at Studio Calico! Is it self-paced? Can I still sign up although it says starts May 15? I am a hybrid scrapper but not very familiar at all with PSE. The class has scheduled lessons but all lessons are available so you can do it at your own pace! And yes you can still sign up! I think you’d definitely learn some new PSE skills! This layout is an 8.5"x11" I just mix those in with my 12×12 protectors.